First off, my apologies. This is going to be a bit of a bummer of a post. I headed out to the Delaware coast on Sunday morning to catch some of the horseshoe crab spawning and shorebird migration. I had originally planned to get out overnight to catch the evening high tide (peak spawning time for the horseshoe crabs) and do some moonlight photography and light painting, but my energy levels and family commitments made that unfeasible. I still got out very early, but when I got to Port Mahon I was depressed to find that they seem to have finally finished the road "improvements". While there used to be some little coves and beaches that didn't have riprap, they've now covered every part, in many places well down into the low tide line, with the jagged concrete blocks and rocks. Pretty much the entire place has been ruined as horseshoe crab spawning habitat (though a few valiant individuals were clearly still trying). It also seemed to be even less birdy than usual. There were still some flocks of ruddy turnstones, dunlin, and semipalmated sandpipers, but even those flocks seemed diminished (and this should have been peak time). What was once a premiere place to catch an amazing spectacle, is now so diminished as to be a questionable destination. I headed instead to the beach at the Ted Harvey Wildlife Management area. I arrived just before sunrise, but also at close to low tide. Having only visited during high tide previously, I had no idea how extensive the mud flats were here at low tide. They seemed to go on forever. There also was definitely a lot of mud and silt, rather than sand. I couldn't help but wonder if it has always been this way here, or if this was also the result of some sort of human intervention or pollution. 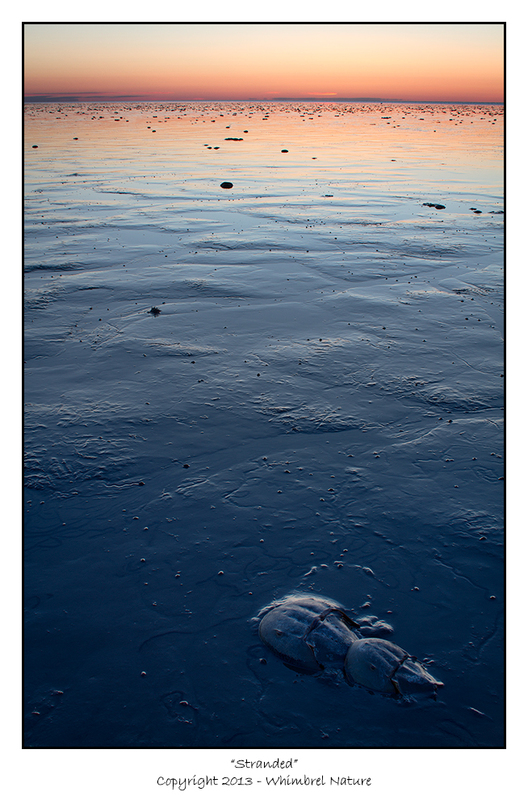 I chose the photograph above, because while beautiful, it also captures visually for me the feeling of hopelessness that I feel for the plight of the horseshoe crabs and especially the birds that depend on them. This spawning pair was mired hopelessly in the soupy muck and had such a long way to go to reach the open water (it is right at the horizon line in this image). It is possible the muck will keep their gills moist until the tide returns and they will survive, but the visual desperation is still evident. This image is an HDR blend created in Photoshop of two images. 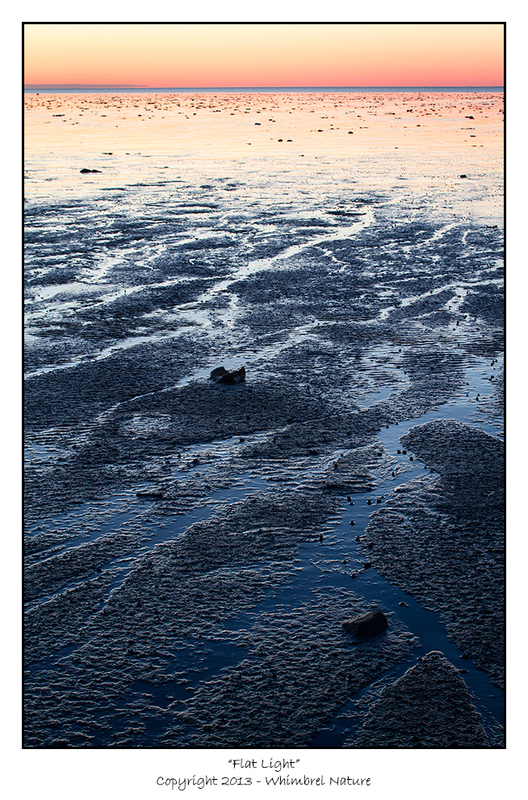 The first was exposed for the sky and the brighter reflections in the mudflats and the second was exposed for the horseshoe crabs and foreground mud which were mostly in the shadows. I set the layer exposed for the crabs to Lighten mode and then used a mask with a gradient to block out the sky and gradually transition the lighter image in to the darker one. I also adjusted the opacity of that layer to maintain consistency of tone and avoid lightening the bottom of the image too much. Besides normal processing, I also did a bit of dodging of the crabs to help them stand out a bit more from the surrounding mud. This may be me dreaming, but if you are someone who is considering a vacation home, residence, or business on the Delaware coast (or any coast for that matter), think about looking at property that is inland a bit, rather than right on the beach, shore, or marsh. All those erosion control structures are used to protect houses and infrastructure (such as the roads to access those houses). If we moved development back off the water a bit (or even a bit more with global warming), we could let the beaches and marshes go back to their natural ebb and flow. This would be healthier for the wildlife and fish populations and healthier for the ocean. Heck, if you are of a conservative bent and environmentalism isn't your thing, think about all the taxpayer and private money that would be saved by not having state/federal emergency situations every time there is a coastal storm or paying out insurance claims for repeatedly flooded and/or hurricane-damaged homes or the constant infrastructure maintenance and repair. If you currently own property right on the water, at least think about including environmental organizations in your estate planning. It is a downer what happened at Port Mahon but the rest of your post is wise and timely. We need to think about the wild places and about leaving them in their natural state. Your post and pictures were so moving that I'm adopting a horseshoe crab right now using the wetlands link you included. Thanks again for getting this out there. @Lisa: Please feel free to share the post on social media. Get the message out there. Glad it resonated with you. It is such a spectacular natural event. It is a shame to see it continually diminished.